Backpackers wholove to travel off the beaten track: be aware that there are cholera outbreaks in Terengganu and Kelantan and that traveling by road towards the Thai border can be impossible due to road closures due to the current floods. However, if you are spending your holidays in beach resorts like the Coral Redang Island Resort, all should be fine... except for the enormous downfalls of rain this year. If you wonder why you managed to get a cheap holiday package for Terengganu or other resorts at the East coast in Malaysia, it is because it's raining season there. 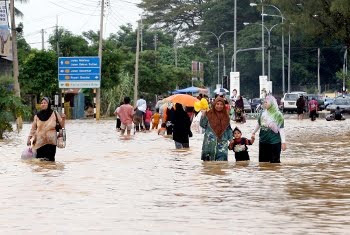 However, if you love the slow paste of island life and you are keen to experience how the tropical rain can bring people together, or you just want to experience what it is like to take a shower during tropical rains, booking a cheap travel to Malaysia's east coast in Terengganu is an ideal value for money option at this time of the year. Do know that the sea can be rough and snorkeling or diving tours could be postponed or cancelled all together. We just don't advice you to go off the beaten track, unless you can't be bothered with cholera nor closed roads in Terengganu, Malaysia.